Not to put too fine a point on it, though this week, we challenge you to show us what “angular” means to you. Photo by Xiao Yu. All rights reserved. After an existential crisis and a stint working as an apprentice brewer, Xiao Yu realized he rather enjoyed working with bits as long as there was a purpose. He now wrangles data at Automattic in hopes of making the internet a better & more democratic place. He still enjoys brewing beer and attempts to run up mountains in his spare time. This photograph was taken in Vancouver, Canada, on a sunny day. I was in an area of the city populated by random high-rise buildings. 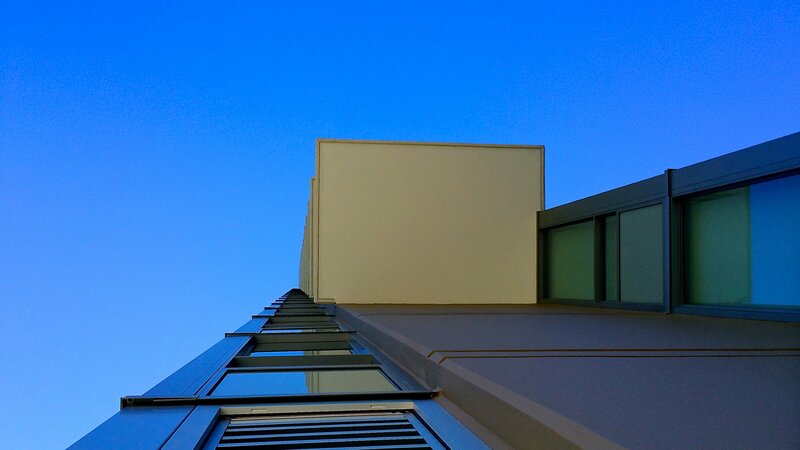 I found that standing right under a high-rise — and looking directly up — made the view much more interesting. Repeating patterns that once seemed boring aligned to form another shape with more depth. The high-rise completely grabbed my attention when viewed from this angle. What does angular mean to you? It might mean the corner on which you live or the intersection of sea and sky at a 180 degree angle. Angular also offers a chance to shoot from an entirely new perspective: from above, below, or even from the margins of the fray. Above all, have fun! I like your perspective for this photo. Nice one. Looking for my photo now. Angular forces of nature and marvels of architecture in your post — very inventive! Thank you for the points of view. Angles are so fun to photograph! What do you think? Have a great weekend, everyone! These colours really highlight the angles! I’ve got an angle on it! Have a beautiful weekend! I have some interesting photos of trees and buildings, but I decided to go puppy! Once more into the debate: are straight lines natural? A great selection and wonderful photo My contribution comes from the “Painted Ladies” of San Francisco. What a fun photo challenge! So many choices and perspectives. A great picture with these lines and perspective! Here is my first ‘angle’ on this theme: straight lines and curves in an office building in Paris. My pingback isn’t showing either Chris. The URL goes to a ‘file not found’ 404. The pingback of my entry does not appear in the list, I use Firefox latest version and the old wordpress editor. The link is copied in from the URL in this window. Wonder why this happens still. Try removing target=”_blank” from your link code. I have a hunch that that is what is interfering with the pingback. Be sure to click on Update for the pingback to refire. Hi Krista, I removed the option and refreshed the theme page, but it did not showed up. In my next post I will remove the tag immediately maybe that helps. Hi Krista, I have been having the same problem the last two weeks and the pungback doesnt seem to work whatever I do, this started last week, been ok for months, would appreciate some help? I managed to get things working again, I own my own domian http://www.belgianstreets.com so I remapped my blog to that and “ping’ all working again, I think the problem may be the forced https code in the url? Yes! We do know that if you use “https” in the pingback URL, as opposed to “http” the pingback will not appear. I got a mail from a tech that they are working on it. I post a message in the forum. Any planning known for this fix? We made some progress on pingbacks last week. It’s a knotty problem that is going to take some time to unravel. We appreciate your patience! After reading a message by Krista that https and target=blank statements prevent wordpress sending automatic pingbacks I combined an entry with the right HTML scripts. And here it is https://chrisbreebaart.wordpress.com/2014/11/24/weekly-photo-challenge-angular-pylon-aka-testing-automatic-wordpress-pingbacks/ Pingbacks do not work still. What worries me is that, since I am on wordpress, everything worked smoothly till two weeks ago. I use the internal editor (that generates WordPress its own scripts) and all of a sudden: bang. nothing. I get terribly frustrated and consider dropping out of WPC altogether, it is not worth the hassle any more. I still can’t connect with the photo challenge original page. But here is my take on this week’s challenge. I hope you like it. 544 Responses While this challenge is closed to new entries, we encourage you to visit the Reader to find other avid bloggers. Required Writing Gak! Oh, hello! readsbyredriverbanks Geometry and jam pans. SMALL-TOWN GIRLS, MIDNIGHT TRAINS Wat? Michelle Lunato Photography Metal. Creations at all Angles. Visual Venturing Happy Hour with a View! Melanie Ryding – Ryding2Health BLOG Angular sand? Luvin life on the lake...usny What’s their angle…Taking a break? Just Snaps Weekly Photo Challenge – a few more Angles! Grace Notes What’s Your Angle? They, You and Me Angular beauty. jane in training what’s your angle? Sze Wey's Kitchen Sink Angular still? Life in the Foothills Angular – A WordPress Photo Challenge! Steve Says... From How Many Angles Can You Look At A Photo?